Use these glass ball filler ideas to make pretty ornaments for Christmas. Here’s a satisfying way to use up left-over craft supplies and other decorations to make one-of-a-kind glass glass ball Christmas ornaments. 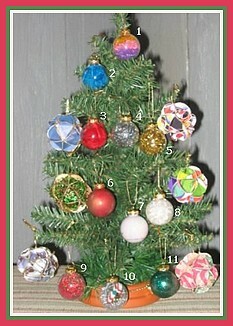 Use bits and pieces left over from other crafts to make this assortment of glass Christmas balls. Assemble your supplies, put on some Christmas music, and get the kids to help you make your own unique tree trims. On this page, we provide directions for the glass balls shown on our little tree. The larger Recycled Christmas card ornaments are easy to make as well – and a great way to re-use old Christmas cards! Don’t be limited by these ideas! Try recycling older ornaments and decorations, and using some of the saved embellishments inside these glass balls. Fill ball with layers of crystal beads, pearls, or seed beads or recycle costume jewellery beads. Snip feathers to fit each ball, and tuck inside the glass. Use the fluffy bottom of the feathers for best effect and shake in some glitter if desired. Cut small pieces of tinsel garland and push inside each ball until lightly packed. Drizzle two or three colors of paint inside each ball, letting paint drip down the sides. Seal top with your finger and shake until paints mix in a pleasing design. Start feeding an iridescent pipe cleaner into a glass ball until filled, then trim off the excess and cap. Fill ball with a scrap of Christmas lace, or any pretty lace with metallic accents to catch the light. Put a small amount of tinsel or a piece of metallic pipe cleaner in the ball. Slide in a small candy cane eraser. Drizzle in a small amount of glitter paint and shake until the inside of ball is covered. Turn ball upside down and let any excess paint drain out before capping.